# - If true, the name will be green in the quest menu. # [NEW] This field will automatically update if conditions for quest are met. 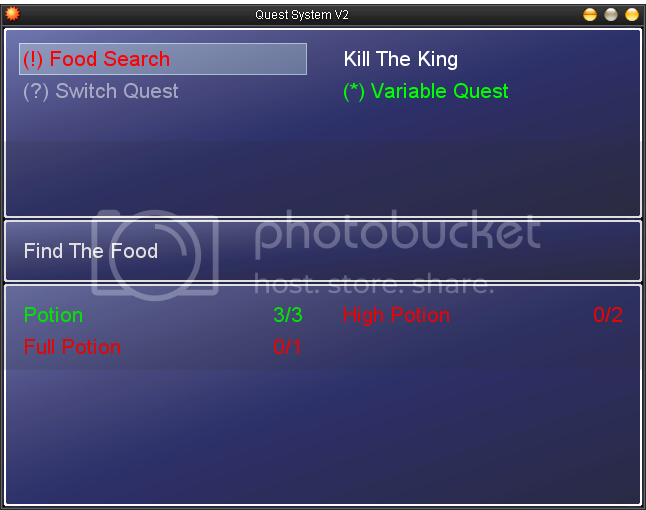 Prexus Wrote: One of the first scripts i've ever wanted to make was a quest manager. Through a little try and try again I made some craptastic one. I forgot about it, and since became a fairly good scripter. I went back and made a really good one. # $quest[id] = PRX_Quest.new Change ID to whatever you want. Just never use the same twice. # $quest[id].name = "Enter Name Here"
# $quest[id].description = "Short Explaination of Quest"
# - A string value that appears in the list. # - An integer value 0-3. # When the value is set to 0, make sure to set .requirements to string values. # These will appear in the quest menu and never change. # if variable 2 is 3 or higher, the second requirement will appear green. # is on, Capture Flag will also appear green. # the database. Then make sure .values are set appropriately. # You'd need 3 potions, 2 high potions, and 1 full potion. 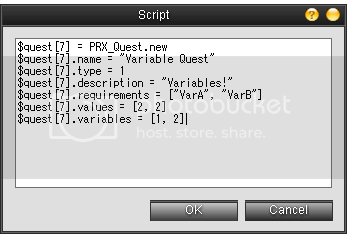 # - A string value that appears in the description box explaining quest. # You need 3 Potions, 2 High Potions, and 1 Full Potion. # If type is 1, this holds how much of each Quest Variable you need. # is set to 2. # - If true, the name will be greyed out in the quest menu. # Note: If both completed and disabled are true, it will appear completed. # If any further questions are needed refer to the RMXP.net thread. $quest.values = [3, 2, 1] # Sets the amount of each item you need to succeed. In this case, 3 Potions, 2 High Potions, 1 Full Potion. 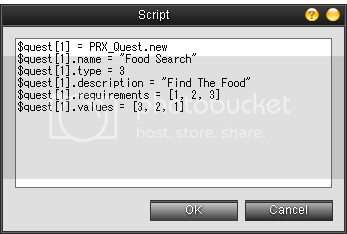 $quest = PRX_Quest.new # Sets the quest, as always. $quest.requirements = ["VarA", "VarB"] # Labels the requirements.. this may say something like, ["Bugbears Killed:", "Locks Picked:"] or something. 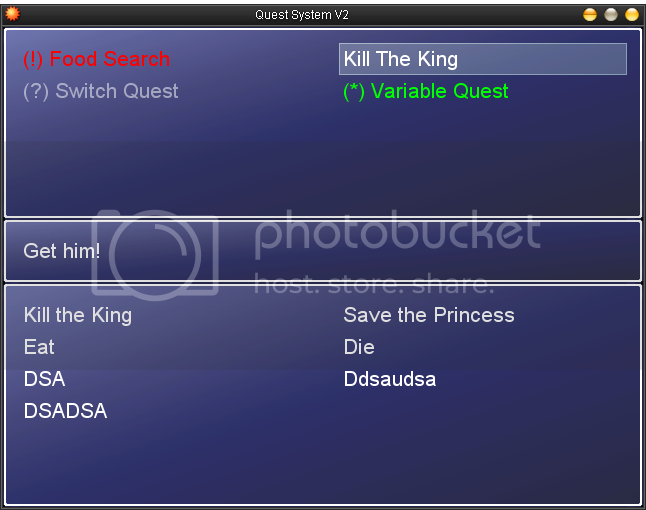 $quest.values = [2, 2] # This defines how much of each requirement you need, in this case you need 2 VarA and 2 VarB, or 2 Bugbear's Killed and 2 Locks Picked. $quest_switches = true # Sets switch 1 to true. 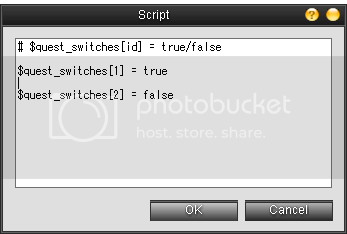 $quest_switches = false # Sets switch 2 to false.